Your Company’s Sales Dilemma: Star Selling Process or Superstar Sellers? Just how different are top salespeople than their peers? How hard is it to create (coach, train, motivate, etc.) someone who is not a top salesperson to become one? My answer to question #1, based on my personal involvement in helping to create psychological assessments that identify top salespeople, is that that the differences are significant. Top or “A” salespeople have much higher scores in the skill areas that we believe to be highly correlated to sales success. These higher scores are largely a result of what I refer to as “wiring,” and others call “DNA.” Yes, the less-naturally gifted in sales can raise their scores but they have to work at it. Therefore, my answer to my question #2 is, “Very difficult.” The most important assumption underlying this discussion is that in sales it is not easy to change a low performer to a high performer or a “B” to an “A.” This has chilling implications for companies that plan to scale their sales by growing their team or increasing productivity. It also has significant implications for the sales training and coaching industry as a whole. But the reality is that this knowledge won’t be of much help to most companies that want to scale the reach of their sales organization. It is very expensive to find and recruit from the limited supply of “A” people, and is probably beyond the grasp of most companies that don’t have the talent budget of the New York Yankees. Is there an alternative strategy to scaling sales results and individual performance? The single thing that will allow companies that don’t have stratospheric sales budgets to raise the trajectory of their sales growth is improving their sales process. The skills we identify to be highly correlated with top sales success are merely mirroring the requirements of the job, or the current “process.” The way the job is defined or structured not surprisingly shapes the skills required to be successful in it. In the sales field today, most people view the role of a salesperson to be highly individualistic and self-sufficient. A sales career often requires someone who is able to think on his or her feet and take solo command of a selling process. 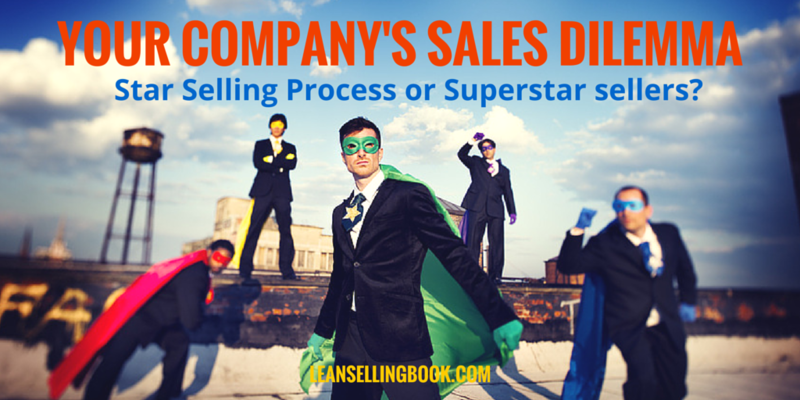 Ironically, as a result, there are as many sales “processes” as there are salespeople. The tried-and-true way that businesses today scale up to a large size while continuing to feed their perpetual growth is to focus on creating and institutionalizing a superstar process that the company expects everyone in the organization to follow. Sometimes, this process is embedded in the products they sell, especially—but not exclusively—in the case of software. Other times it is manifested in their production, delivery, product design and development, purchasing, or other operational processes that give these companies a significant competitive edge and is reflected in the value they provide to their customers. Leading companies create their own definition of top talent; they define both the hard and soft skills they require based on the demands of their unique company’s—not individuals’—processes. While the very best people in any domain are always in demand, these companies have special requirements for selecting talent, based on their homegrown or adapted corporate processes. Often, they are not looking for the same skills that their competitors are. Since formalizing, institutionalizing, and continually improving business process is the key to success for so many top companies, it shouldn’t be surprising that it’s the key to scalability in sales as well. However, the reality is that most top sales performers don’t like to follow someone else’s process. (Remember, we “chose” them because they were individualist and could think on their feet.) These top salespeople like to follow their own handcrafted selling process. It works for them. During a presentation I gave recently to a group of senior sales managers and professionals, consultants, coaches, and trainers at the Orange County, California, monthly meeting of the Sales Leadership Alliance, I asked how many people were or had ever been in a company—or had a client—where every salesperson followed the established sales process. Not one hand went up. Not one! I asked why that was and one experienced sales trainer volunteered that there is always one or more salespeople who will not get on board with a new sales process. Those individuals didn’t hide that fact, and management was made aware of the situation, but tolerated it nonetheless. I’m willing to bet that these non-conformers also happened to be the company’s top sales performers. This brings us to the real dilemma facing companies that want to scale their sales. 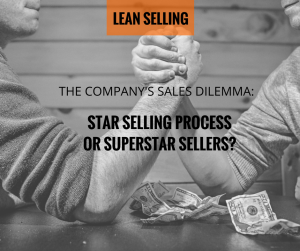 These companies find themselves in the unenviable position of having to make a choice between a continual struggle to find and retain selling superstars to keep their sales results moving up and making an investment in developing a star salesprocess that is scalable and maintainable. Business processes only yield their maximum benefit when everyone on the team follows them. Therefore, deciding to invest in improvement of the sales process is a very strategic one for a company that should be made with eyes wide open. This is because enforcing a radically new process in sales is likely to cause the superstars to find other places to perform their magic, where it is more appreciated—and required. Top executives have to be confident that the business can weather the transition. 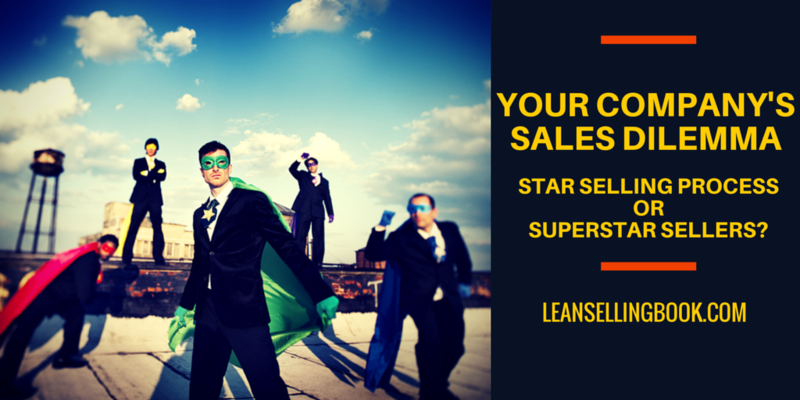 The transformation from individual sales processes to a fully-committed team selling process requires excellent execution as well as executive commitment to the transition from reliance on superstars to reliance on a star process. That’s why I believe, in the short-term at least, only the most forward-looking, long-term-thinking companies will take on this challenge—and seize the opportunity it presents. For the organizations that successfully cross this chasm, they will have a sustainable competitive advantage within their industries based on how they sell—in addition to whatever other market and product or service advantages they may already have or will develop. What are your thoughts about how companies should deal with this strategic sales dilemma?